Did you realise that just by looking at a good painting for 10 minutes you can improve your health? It can dramatically reduce your cortisol levels and lower your blood pressure? That doesn’t mean you have to rush out and buy pointe shoes or learn to sculpt – although it it’s a good idea. You can gain the same benefits by watching ballet, going to a concert, looking at a painting – or joining a knitting group and sharing the experience with others. That connects you to community, which is really important for your health and wellbeing too. For during the Great Golden Times of the Athenian Philosophers, Aristotle actually stipulated the toning down of music to youth because it stimulated their emotions! Artists and creative thinkers undoubtedly make our society richer. Although we might have known that arts and culture contribute to our wellbeing, it has been hard to measure over the years, which is why there are now so many research projects on the subject underway in hospitals and universities round the world. It may surprise you because although we’ve always known it was “nice” to engage in the arts, but we didn’t know was that it is actually good for our health. The good feelings that you have when you are looking at a beautiful painting or piece of sculpture –are actually reflected in your health. There’s so much new physical and psychological evidence. These projects have registered dramatic changes in patient’s psychoses after engaging in arts and culture in their programs. The researchers have developed a method of assessment by creating biological benchmarks of the national average, and measuring heart rates of participants and applying immunology. It is producing extremely positive results: listening to music for instance, sends communicating messages throughout the body that make noticeable changes in condition within an hour. We know that the key to much that is wrong in the world lies in addressing the issue of mental health. The new focus needs to be on the whole person and on preventative care. The good news is that medical scientists now believe that it is time to take healing out of the health arena; and focus on wellbeing, rather than disease management. Healers are discovering that art, music, dance and literature, poetry and theatre, have profound effects on our health and wellbeing and our brain, and that combined with traditional medicine, are powerful tools. That means the arts and artists will become an essential part of the healthcare regime – doctors, nurses, therapists and social workers round the world are now working with artists and musicians to help healing people of all ages and with many conditions including cancer, Aids, Parkinson’s disease, dementia, learning difficulties, brain damage from strokes or accidents and other trauma, helping refugees and other displaced, people with disabilities and other challenges. I am convinced that engagement in arts & culture is the potion that offers joy, hope and possibility to people of all ages and status – young, old, impoverished, disadvantaged, recovering from illness, crime or substance abuse, depressed, lonely or distraught across the globe. Imagine a scenario where your doctor or health therapist tells you that the best medicine they can prescribe for you is buying a season pass to the theatre or joining a choir – or enrolling in a workshop of one of the many talented artists in our region. For engaging in your local community in an arts or cultural activity offers major benefits – combating loneliness and giving connection and purpose. It eases the pain of loneliness, gives purpose to your life, and transports you away from the aches and pains of the aging process. It improves your lifestyle and therefore health and wellbeing any stage in your life. If you join a dance class, for instance, it can improve your balance, your flexibility, co-ordination and more importantly, keep your brain active – keep away the horrors of brain fog… and we all dread that. The more I researched The Arts Apothecary, the more I became convinced that the arts carry the means to effect social change. Major arts institutions like the Museum of Modern Art – MoMA, New York, have recognised this and have developed a whole series of programs for the 65+ group under the name of Prime Time because of the success of its Meet me in MoMA – which was designed for Alzheimer sufferers and which has been taken up round the world. I’m urging you to connect to the culture of your land and to your community for its unsung benefits offsetting loneliness, giving purpose, relieving stress and anxiety —through the arts. Find your joy through the arts. Join that choir, sign up for a painting course; take the pleasure of being in that space. Jill Rivers is an Arts for Wellness Advocate, writer, speaker and coach who has been immersed in making arts & culture accessible for over forty years – as a journalist specialising in food, wine & the arts, later as Media Director of The Australian Ballet. She has served on various dance boards, staged events such as the Australian Dance Awards, National Choreographic Workshops, written a dance biography and film script, high-end travel itineraries for the cultural capitals of Australia, New Zealand and China and started a series of Public Programs - Artspeak at the (Victorian) Arts Centre. In 2008 she abandoned city life to move to the Macedon Ranges, where she established Daylesford Macedon Ranges Open Studios and Art-full Conversations – sharing the secrets of Movers, Shakers & Creators and recently launched a campaign of weekly Art-full Challenges to BE CREATIVE. 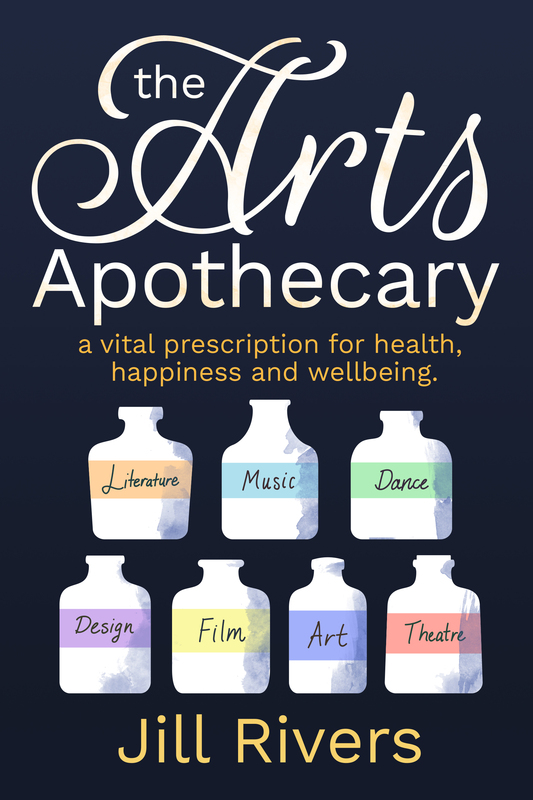 The Arts Apothecary was published in July 2017.
in a series of salon-like talks, in pursuit of her goal.